Designer Adrienne Dorig’s award-winning small bath design incorporates a Geberit in-wall dual-flush toilet system, increasing space while decreasing water usage. The dairy-farming community of Fall Creek, Wisconsin prides itself on enjoying a modern lifestyle while maintaining its rural past. Fall Creek is a small but growing central Wisconsin community of 1,300 with limited accommodations. The owners of a turn-of-the-century Fall Creek farmhouse wished to improve their main-floor guest bathroom to accommodate overnight visitors. One of the crucial challenges facing Adrienne Dorig, of Dorig Designs in Eau Claire, Wisconsin, was to “open up” the tiny guest bath space on the main floor. Improvements to the space had to include shower and toilet accessibility and conveniences for her client’s older guests. When the guest bathroom door opened it collided with the clawfoot bathtub, allowing very little maneuvering space. A low ceiling and narrow, windowless layout made the space feel extremely cramped and confined. Dorig had to use every bit of existing space efficiently with a design that complemented the rustic style of the farmhouse. A creative use of modern plumbing technology would allow for water-efficient, sustainable amenities that could also reduce stress on the rural septic system. Every critical inch of space had to be accounted for. Dorig was able to save space and meet her clients’ design objectives through the use of the Geberit in-wall system. The perfect solution for saving those precious inches was a Geberit Concealed Tank and Carrier System with a Bolero dual-flush plate and wall-hung, adjustable-height Duravit toilet. The in-wall Geberit system hides the toilet tank and plumbing hardware inside the wall, allowing flexibility in positioning of the toilet – especially important in older houses. The dual-flush valve also reduces stress on the farmhouse’s septic system and leach field. The Geberit dual-flush system lets the user choose between a standard flush (1.6 gpf/6 lpf) for solids and a low-volume flush (0.8 gpf/3 lpf) for liquids. 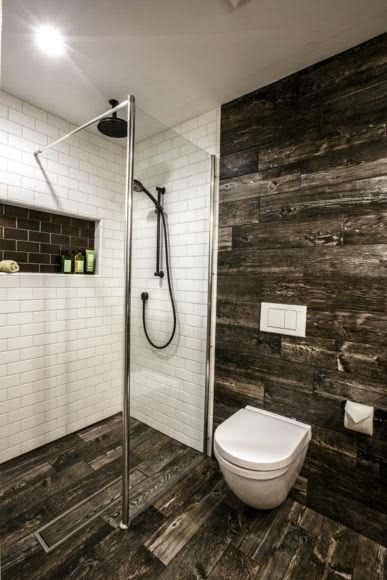 To maximize the limited space, Dorig removed the old floor-mount toilet and the bathtub, keeping the style simple, functional, and cutting-edge. 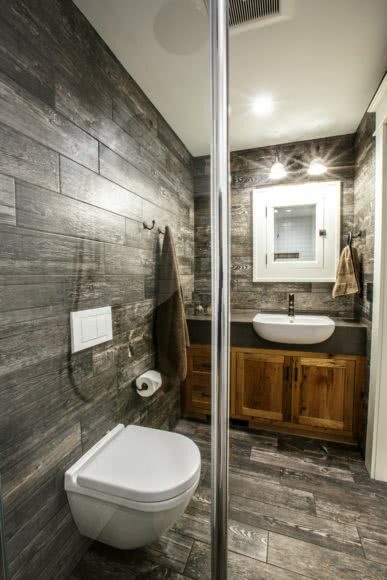 Dark porcelain tile on the walls and floor gives the bathroom the rustic look of distressed wood, while bright white accents like the Geberit flush plate, recessed sink, medicine cabinet, and shower tile provide sharp contrast. The homeowner requested “ease-of-use” for older guests. The Geberit in-wall toilet tank with wall-hung toilet and easy flushing, plus a walk-in curbless, doorless shower, was the right way to go. To make further use of the remaining bathroom space, Dorig also installed a pocket door and a narrow but deep vanity with a semi-recessed sink. “The customer loved the improved space and the contrasting design,” Dorig says. The Geberit in-wall system with dual-flush technology and actuator plate can potentially save thousands of gallons of water per year. Dorig’s “green” design reduces overall energy consumption with LED lights, an exhaust fan that adjusts automatically by detecting humidity levels, an air-injected faucet and hand shower, and, of course, the Geberit dual-flush system. Walls and floors are finished with tile containing recycled content and grout with low VOC. Shelving is made from reclaimed materials, and the countertop is made of glass-fiber reinforced concrete with recycled material that uses less Portland cement than regular concrete. For Geberit, sustainability has been part of the culture for decades. It takes many forms: water-saving products, new logistics solutions, energy-efficient production plants, and responsible training. For example, every Geberit flush valve comes with dual-flush capability built in – the attractive flush plate guides you: large button for solid waste (full flush) and small button for liquid waste (water-conserving flush). Typical usage of a Geberit dual-flush system and flush plate can save thousands of gallons of water per year. Geberit toilet systems make water savings easy, convenient, and intuitive. Visit the Geberit Group’s website and find out how sustainable thinking and action have an impact on all aspects of our daily lives. Dorig’s design achieved third place in the Small Bath Category of the 2015 National Kitchen and Bath Association (NKBA) Design Contest. Winners were chosen from 300 entries across six main kitchen and bath categories and ten specialty categories. Entries were scored on safety and ergonomics, elements and principles of design, design planning, creativity, and presentation. Geberit North America is part of the Geberit Group, a European market leader and global provider of sanitary technology. Located in Des Plaines, Illinois, Geberit North America provides concealed tank and carrier systems for wall-hung and floor-mounted toilets and fixtures. Dorig Designs is an award-winning design company based in Eau Claire, Wisconsin, serving clients at home and across state lines. Dorig Designs specializes in exquisitely detailed kitchens and baths and offers full service interior design from concept to construction drawings.